In the first two articles in this series we discussed the dangers to America of losing its Christian heritage, and of losing its freedom of religion (see LINKS below). Today we will discuss the serious danger our nation faces of losing its national sovereignty and becoming part of a one world government. The most effective plan Satan ever hatched was to make people think he doesn't exist. Mention Satan around people who don't know the Bible, and they'll make jokes about a little guy with horns carrying a pitchfork. Satan loves that kind of stupidity; it's part of his plan. But any thinking person who has seen the evil that exists in this world knows that he exists, just as we know that all that is good comes from God. And the people who plan to be in charge of the world when their plan comes to fruition are perfectly happy for you to be ignorant of it and ridicule it now. They know you won't be laughing later. The other thing to consider is history, which is replete with men who tried very hard to become the king of the world. Why is it so hard for people today to understand that the lust for power did not die with Caesar or Napoleon or Hitler? Do they think we have become too civilized, too advanced? No, the heart of unregenerate man is just as evil today as it was hundreds of years ago. The desire for power is the same. The methods used to try to attain that power will just be more subtle today. You see, the evil geniuses have figured out that military might and bloodshed is no longer the most effective way to take over a nation. And, of course, it is very messy. Why bomb bridges and buildings that you will need after the takeover, when you can quietly accomplish the same purpose by simply controlling a nation's money? Sound far-fetched? The model was the European Union (EU). It started small, with just six nations who formed the European Coal and Steel Community in 1951, described as "a first step in the federation of Europe." But the one world government types are patient. In 1957 the same six nations (Belgium, France, Italy, Luxembourg, the Netherlands and West Germany) signed the Treaties of Rome, which transformed their earlier trade cooperation in coal and steel into the European Economic Community (EEC), and added a customs union and Eurotom (the European Atomic Energy Community). Ten years later these unions were merged into one entity called the European Communities (EC). Over the years more nations joined the community, giving up, among other things, passport and border control. There were many steps and additional treaties along the way, which culminated in the 1993 Maastricht Treaty which formalized what is known today as the European Union. It all sounds very nice and civilized, until one realizes that little by little these nations are giving up their national sovereignty, customs, culture, and ultimately, identity. Oh, if you look on the EU website, you will see lots of pretty words about the cooperation of sovereign nations. But that's all they are - pretty words. In our lifetimes we will see people who call themselves proud Britons or Spaniards demonized as "Right Wing Nationalists" or even "Racists." They will be ordered to take "sensitivity classes" where they will learn that they are citizens of the World. The assimilation of nations into this union has not taken place smoothly. The decision on whether or not a country joined was handled differently in different nations, but many of them did not allow the people to vote, and in those that did the politicians often unfairly influenced the process. Even so, the French and Dutch rejected the European Constitution, forcing the one world types to take another path. The replacement Lisbon Treaty was eventually signed by all the member nations except Ireland, whose voters rejected it in June, 2008. That issue is still up in the air. But the EU strong men will prevail, and all nations will eventually toe the line. How will this happen? It's happening now. The key, as always is the money. Of the current 27 member nations of the EU, 16 have adopted the Euro as their currency. This began in 1969 when the EU made it official policy to push for a single currency. Ostensibly the purpose was to facilitate trade, but of course the real reason was control. In 1993, with the signing of the Maastricht Treaty, all member nations (except the United Kingdom and Denmark, who wisely refused to sign unless they could opt out of the Euro) were legally obligated to start the process of transitioning to the Euro by January, 1999. Sweden has deliberately avoided the obligation to move toward the Euro by failing to meet all EU membership criteria. The other eight member states which have not adopted the Euro are simply dragging their feet, probably because they have seen what has happened to those who have. The Euro was strictly an accounting currency until January 1, 2002, at which time paper money and coins were first issued. At that point 12 nations adopted the Euro; four have done so since. Just as in the United States when the Federal Reserve System started issuing its "Monopoly Money" and US banks starting pulling the real money (currency backed by gold) from circulation; so did the European banks start to remove the national currencies from circulation almost immediately. And just as today the only place you will see real gold certificates in the US is in a collectors hands; so the national currency of the 16 EU nations that have adopted the Euro is fast becoming a fond memory. What's the big deal about controlling your own money? You might as well ask, "What's the big deal about controlling your own economy?" In the United States the Federal Reserves system, a network of private banks (not the United States government) controls our money. (See LINK below to the article, "The Non-Federal Fed".) If they decide to print more money, backed by absolutely nothing, they can legally do so, and in the process cause massive inflation. But at least in the US (at least for now), Congress has some control over the "quasi-governmental" private banking network laughably called the "Federal" Reserve System. In Europe, the 16 sucker (excuse me, "member") states that have adopted the Euro have no control over their currency. And therein lays the rub. If I had time I could give you dozens of examples in which these nations' laws have been overruled by the European Parliament, and their Supreme Court rulings struck down by the EU's Supreme Court. Yes, this has also happened to member nations who have so far maintained their own currencies. But not nearly as often, and usually on less serious matters. As time goes on, and as more nations join the Euro bandwagon, the European Union will gain more and more power, until the sovereign states of Europe are sovereign in name only. 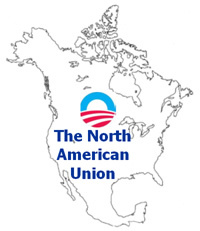 In strange twist of events, one world advocates in the United States, Canada and Mexico are now using the European Union as a model for what they propose to call the North American Union. Like the EU, they claim its purpose is just to facilitate trade. But their real intent is obvious: Another conglomerate nation like the EU, which will join with the Union of South American Nations, an African Union, and so on to eventually form an international government. The first step was very similar to Europe's EEC (European Economic Community). 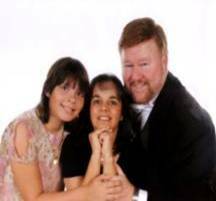 We called ours NAFTA (the North American Free Trade Agreement), and most Americans were so busy buying lotto tickets and going to parties that they never noticed it happening. NAFTA effectively made our borders with Mexico and Canada a joke, and allowed unsafe Mexican commercial trucks, which previously had to meet US safety and insurance standards, to freely roam the US - all in the name of "free trade." The next step will be the Amero. Never heard of it? They've been talking about it for years. (See LINK below.) Don't worry, they say. It won't replace the dollar - it will only be used for trade (like the Euro?). But once it starts to circulate, watch the dollars disappear. It has already happened once in this nation. If we don't stand up to them, it will happen again. Formed in May, 2008, UNSUR (the Union of South American Nations) is already working towards currency integration. The African Union is headed by brutal dictator Muammar Gaddafi, described on their website as "Great Socialist People's Libyan Arab Jamahiriya" (see LINK below). They have established an African Central Bank, and Gaddafi is pushing for a single African currency. Gaddafi has persuaded 200 African tribes to name him King of Kings. The BRIC nations, which include the world's largest developing nations, comprise 26.8% of the world's population. BRIC is an acronym for Brazil, Russia, India and China. (Brazil is also a member of UNSUR, but it is a young organization, and the benefits of the BRIC alliance will probably outweigh those of UNSUR.) These nations have formed special trading alliance, and until recently most of their trade was in US dollars. However, they have now agreed to accept each others' currencies in trade, and there has been some discussion of a BRIC currency. Finally, China has been strongly pushing for a world currency backed by gold. This is not surprising, since China has been secretly adding to its gold reserves, almost doubling them since 2003 according to an April Reuters article. (See LINK below.) In the same article a Chinese official indicated that China would increase those levels by five times more. When one considers that the US dollar is already under tremendous pressure from the unprecedented deficit spending of the Obama Administration, and the printing of trillions of dollars that have no backing, China's announcement causes serious concerns for the dollar. China is by far the largest holder of US debt in the world. If it plans to buy such huge amounts of gold, it must flood the market with US dollars to do so, causing even greater losses for the dollar. And thus, we come full circle. We stated earlier that control of a nation's currency is the easiest way to control a nation. What simpler way could there be to make a nation welcome something like the Amero or China's suggested one world currency (the Chino?) than to have a pro-world-government president like Obama in charge when the nation is in the midst of a financial crisis? He's always talking about the New World Order. And he's certainly done more to hurt the economy than to help it.